This afternoon I had a little baking session. 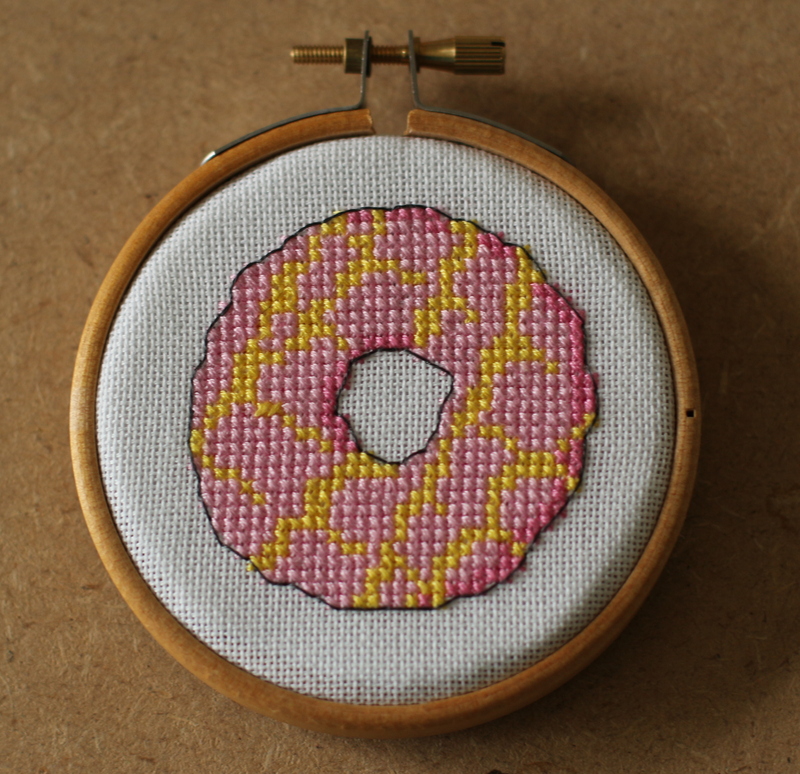 This little baking and decorating session was inspired by a quick little cross stitch project I completed this week. This was from the June 2013 issue of CrossStitcher Magazine, bookmarked (literally) for (2) years and not yet tackled! On our recent trip home for a wedding we indulged in all our favourite British treats, but I forgot to get some Party Rings! Eeeeeek! 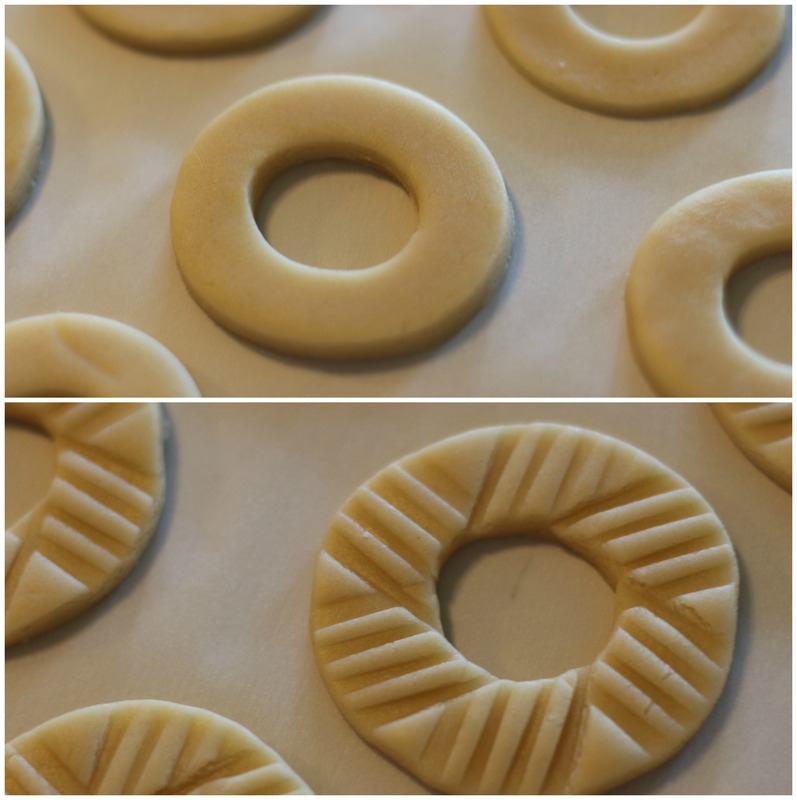 It had also been far too long since I got my bake on, so……….. Time to make some Party Rings! the icing needs to be colourful and feathered! Food colours – NB. gel colours will give a more intense result. Whisk together the flour and salt in a bowl to combine and set aside. Using your mixer, cream together the butter and sugar until light and fluffy. Add the egg and vanilla and mix until well blended. With the mixer on low, add the flour/salt mixture a little at a time until the two are thoroughly blended. Line 4 baking sheets with non-stick baking paper. Turn out the dough onto the work surface and bring together into a ball, then divide into two and roll out to a thickness of 2-3mm. 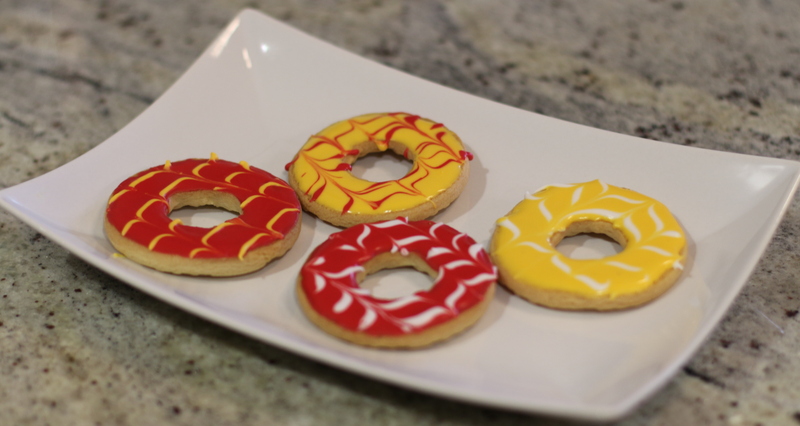 Cut out rings of dough, then imprint with a design. NB. 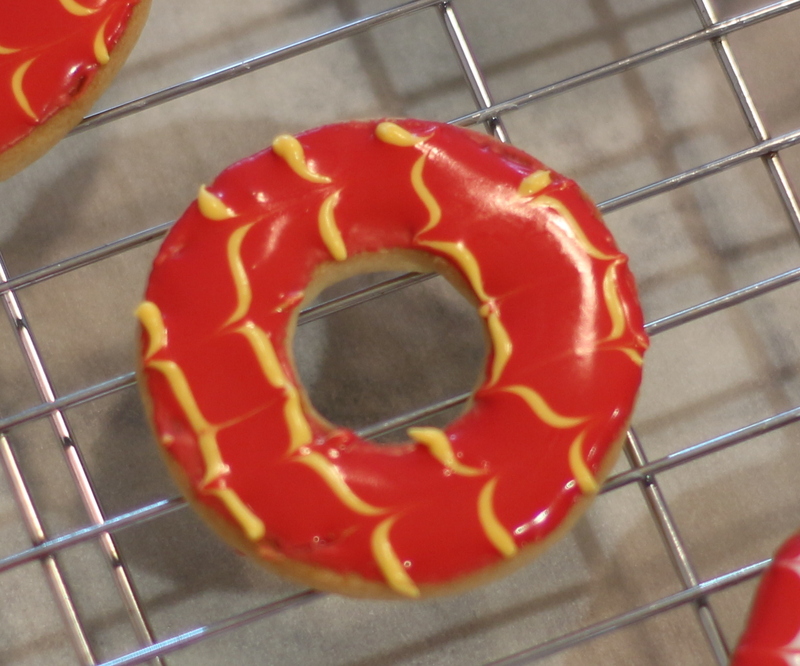 I used my small Ateco doughnut cutter, but you could use a small round cutter and an inverted piping nozzle too. 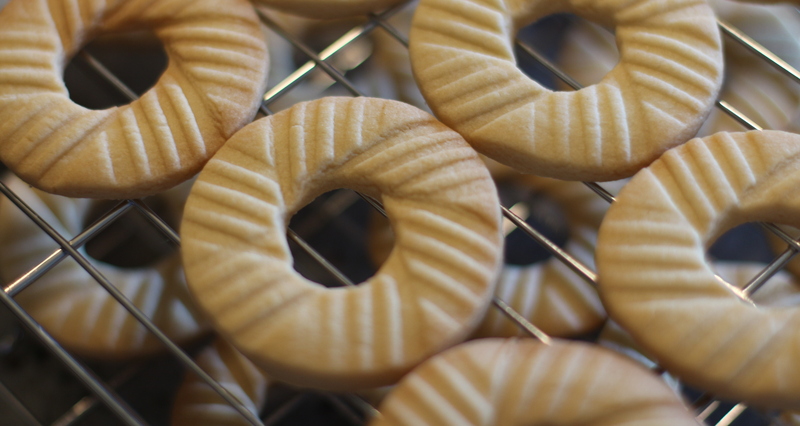 For the design, I went for a slight nod to the original and used a fork, pressing it into the dough at a slight angle, then rotating the cut out circles through 360 degrees. 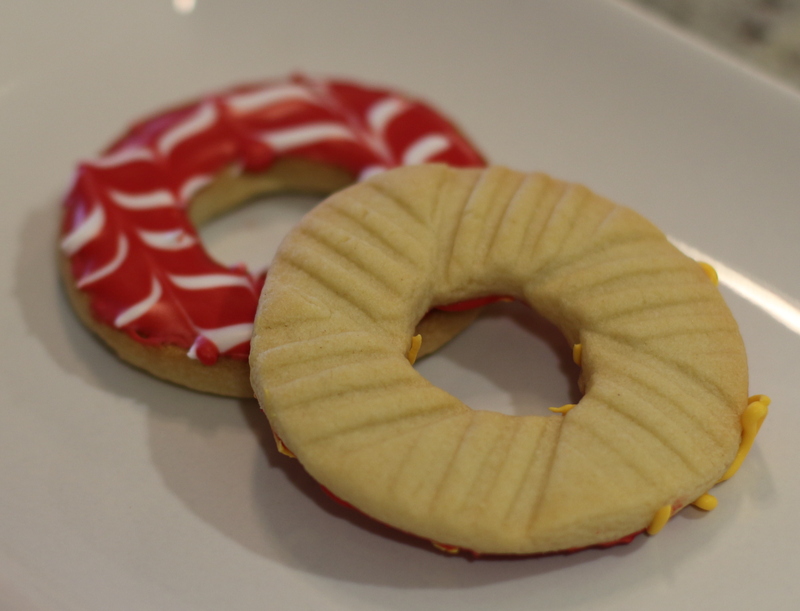 Chill the cut and imprinted dough for 20-30 minutes. Bake in the centre of the oven for 12-16 minutes, keeping an eye on them and turning the trays if they start to cook unevenly. Take one egg white and add sugar until the consistency is that of run-out icing, or soup. It wants to be fairly runny as otherwise the lines won’t blend into the main colour. If it is too thick, add a few drops of water until it is correct. Repeat until all the biscuits are iced. Excuse me while I just go eat about 5……. Very impressive, they look just like the real thing! And love the cross stitch too. Thanks! They were tasty too, I took them into work and they were gobbled up!